and examples and samples of possible costumes that can be applied to human bodies on the flesh. Become A Walking Body of Art! Temporary Body Costumes Painted on naked flesh! Can't find That Costume To Ware? Will Paint It On For You! Creative way to express yourself at the next adult party. 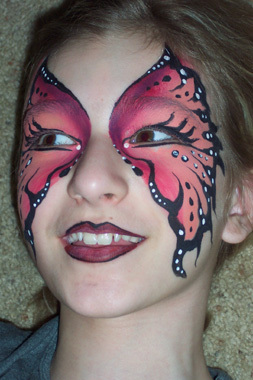 We only use safe acrylic artist paints to cover your skin. Washable and comfortable. Suprise! I am naked and you can't tell! Full Body $150.00 simple up to $500.00 USD for complex art. Make An Appointment Today for your next party! E-Mail us for your appointment today! Please give date/name/address to meet/contact phone and e-mail address. Please place in subject line "Body Art for Me"
This is a business. Please be serious. 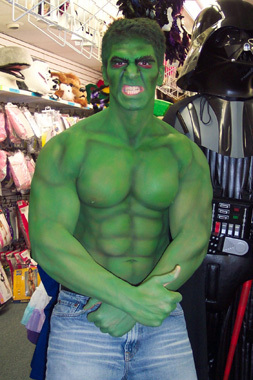 WE APPLY COSTUME AT YOUR LOCATION so you get to your event fresh and neat. 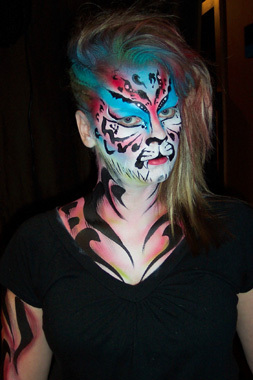 SAMPLE of Work Completed in 2010 of Oct.
Craig's List Ad "Painted Body Art By Local Artist"